Use simple gestures to draw shapes, create objects, and style it all until it's just right. Share your creations via PDF or keep up the fine tuning in OmniGraffle for Mac. 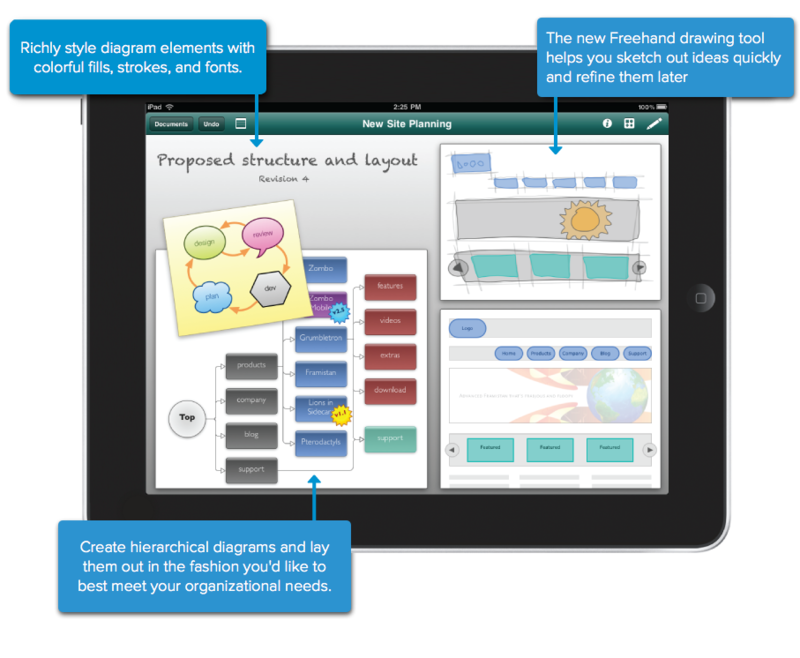 When you have a vision for how your information needs to be presented or your processes are carried out, OmniGraffle for iPad is the tool to help you organize your thoughts visually, document them beautifully, and communicate your ideas to the world. Your iPad is your canvas with OmniGraffle for iPad. Start with OmniGraffle for iPad's built-in Stencil collection for fast document creation: just touch and hold a shape, then drag it into the canvas. If you prefer a more hands-on approach, tap the Draw button in the toolbar to enter Draw mode. Choose the shape you want from the Shape Inspector, then drag out custom-sized shapes. To draw a line, just touch and hold the canvas, then drag. Adjustable shapes such as stars and circles can be manipulated with the touch of a finger, so you can easily change a 5-pointed star into an 12-pointed star (and decide just how pointy you want its points to be) or draw a perfect quarter-circle. Built-in stencils include Shapes, 3D Shapes, Connections, Fonts, Fills, Software, and Variables. Many third-party OmniGraffle stencils are also supported. Qweas is providing links to OmniGraffle for iPad 1.6 as a courtesy, and makes no representations regarding OmniGraffle for iPad or any other applications or any information related thereto. Any questions, complaints or claims regarding this application OmniGraffle for iPad 1.6 must be directed to the appropriate software vendor. You may click the publisher link of OmniGraffle for iPad on the top of this page to get more details about the vendor.